Are you looking for best bungee jumping locations in the world? Well, You have visited the right place to know everything about the best locations for bungee jumping. Of course every bungee jumping is going to be based on personal perspective, but some places where you can fly deserve to be done at least once. These 7 bungee jumping spots have personality, character, and something special that sets them apart and make them special. At nearly 500 feet above the ground, the Perrine Bridge connects Highway 93 with Interstate 84 and allows Idaho Falls to have a gateway to the rest of the state without a lengthy detour. The bridge spans two cliff sides of the Snake River Canyon, the bridge was finished in 1976. This bridge is thought to be the only bridge in the US that allows BASE jumping without a permit, but it is also the perfect place to enjoy a good bungee jump. There is a visitor’s center adjacent to the bridge that has walking trails and viewpoints, as well as easy pedestrian access to the bridge. Because it is an arterial bridge, however, it often has heavy loads of traffic on it throughout the day. The fall into the Canyon, however, is well worth any risk that might be faced. Providing one of the most dramatic backdrops for a bungee jump on the planet, that fact alone allows Victoria Falls to make this list. Crossing the Zambezi River, the bridge actually connects Zimbabwe with Zambia. This means there are border crossing stations on each side of the bridge, which can sometimes make a bungee jump difficult. For that reason, if you wish to cross this jump off your bucket list, it may be helpful to hire a tour operator to assist you. Keep in mind that there are crocodiles that call the Zambezi River home. If you have to cut your cord for some reason or it snaps, you’ll want to bring along some protection. Croc protection. You probably know Contra Dam better as Verzasca Dam and if you’ve seen GoldenEye, then you’ve got an idea of what a bungee jump off of the 4th highest dam in Switzerland is like. The stunt, which occurs in the opening sequence of the film, has been voted the best movie stunt of all time… so why not recreate it for yourself? Unlike other dams, Contra Dam is only a slight arch dam and it is quite slender. At its peak height, it stretches up over 1,200 feet! A commercial bungee jumping operator owns the lease that allows you to legally jump from the bridge, so you may wish to contact them in regards to any jumps you may want to do. At just 43 meters high, the Kawarau Bridge is far from being the highest bungee jump you can do today. It’s also not the most spectacular bungee jump ever as you’re jumping into a small canyon that holds the Kawarau River. You can, however, choose to jump far enough to touch the water… or get dunked into the river if you wish. Why Kawarau Bridge makes this list is because it is known as the location of the world’s first bungee jump in 1988. Jumping from here means you’re getting to take a jump from a place where history was made and that makes it special. Don’t forget to get your commemorative t-shirt after you’ve completed the jump! Located in a Portuguese colony until it was handed over to the Chinese in an exchange in 1999, Macau Tower is governed by a special administrative region today. At the top floor of the tower, a walk-out platform exists that makes this tower one of the best places in the world to complete a bungee jump at over 700 feet! The jump itself is commercially-based, which makes it easy for anyone to be able to complete it should they wish to do so. Easily the tallest building in Las Vegas, at almost 1,150 feet, it is also the biggest freestanding observation tower in the United States. There are rides that you can take at the top of the building that allow you to experience the full height that the Stratosphere brings. To be fair, the skyjump isn’t technically a bungee jump, but you are attached to a high-speed descent wire and you get to plummet over 800 feet. Even though the descent is controlled, taking a dive toward the Las Vegas Strip does have its advantages. And, if you’re feeling lucky, play some Blackjack down in the casino after you’re done! Don’t forget to catch a show while in town as well! Maybe the ultimate experience in bungee jumping occurs over the Bhote Kosi River. On a steel suspension bridge that has been specially made for jumping, it provides jumpers with a 500 foot drop into a tree-lined river gorge that features whitewater rapids going through it. Snow-capped mountains are in the background for the half-day journey that is required to make it to this privately owned bridge. Once you see the jump, however, you’ll realize how beautiful, safe, and spectacular it really is! Do you have a favorite bungee jumping spot? 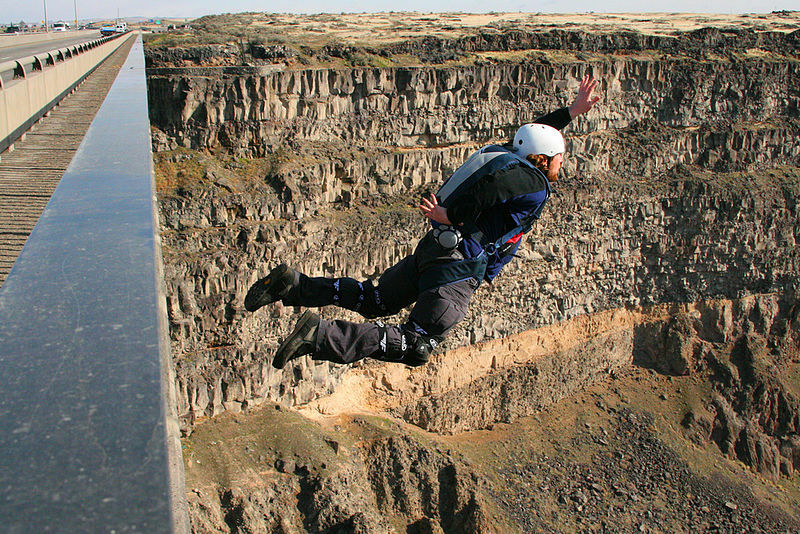 Have you jumped from one of these 7 bungee jumping locations? Please share your thoughts with us in the comments below!